[prMac.com] Princeton, New Jersey - Sender Software LLC today is very pleased to announce that Stock Grader, its stock analyst app for iOS devices, will be free on the 22nd as a holiday promotion. Stock Grader uses a proprietary database and advanced computer algorithms to automatically grade stocks so the user can make informed investment decisions. "If you're searching for a little extra information on a stock before deciding whether to invest, this app may help you," says Lance Davis of Bankrate. "The app gives a letter grade to a stock's profitability, efficiency, liabilities and valuation, while also providing info on other criteria, such as the price-earnings ratio. It's easy to use and can efficiently provide key information on potential investments." 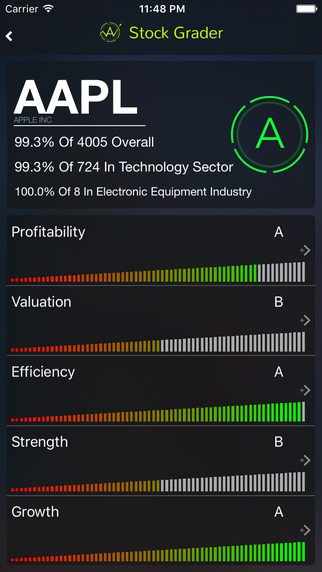 After fetching the data and running the calculations, Stock Grader assigns the company's stock a letter grade. Stock Grader grades on a basic A, B, C, D, or F system. Grades are assessed according to an analysis of five aspects of the business: Profitability, Valuation, Efficiency, Strength, and Growth. The Profitability grade assesses a company's ability to profit and grow. The grade on Efficiency reflects the company's ability to use resources efficiently. The Strength grade indicates the amount of risk and how the company uses debt. The Valuation grades is a measure of how the company is currently priced. The Growth grade illustrates how fast the company has grown, and the quality of this growth. Each of these aspects contributes to the aggregated score that is calculated and displayed as an overall stock grade, but you may also view the scores for each of these sub-grades. "Stock Grader couldn't possibly be any easier to use," says Tyler Tschida of AppAdvice. "This finance app is ideal for any investor looking for a little extra help." "Stock Grader is a personal analyst in your pocket," explains Ben Sender, owner of Sender Software. "Using dozens of financial criteria and advanced computer algorithms, Stock Grader digs deep into your stocks, automatically grading them to help you make confident, informed investment decisions. Take the emotion out of investing and put technology on your side with Stock Grader." For a limited time, Stock Grader is available completely free worldwide, exclusively through the App Store in the Finance category. Based in Princeton, New Jersey, independent developer Ben Sender is the founder of Sender Software LLC, which continually focuses on seeking out new app ideas not presently reflected in the market, and bringing them to life, concentrating mostly in the finance sector. Sender is also an author for the popular financial site, Seeking Alpha. Copyright (C) 2015 Sender Software LLC. All Rights Reserved. Apple, the Apple logo, iPhone and iPod are registered trademarks of Apple Inc. in the U.S. and/or other countries.